Vero Beach Art Club artist Karen Leffel-Massengill designed the artwork and painted it with Mary Ellen Koser and her committee. The Hibiscus mural is painted on the six foot high block wall along SR60 by the RR tracks to help bring art into public places. Vero Beach is known as "Hibiscus City" so this is a fitting tribute. The wall is so brightly colored you can't help but notice the beautiful flowers as you drive by. See the map at the bottom for the exact location. Unfortunately our wall had graffiti painted on it in 2017. 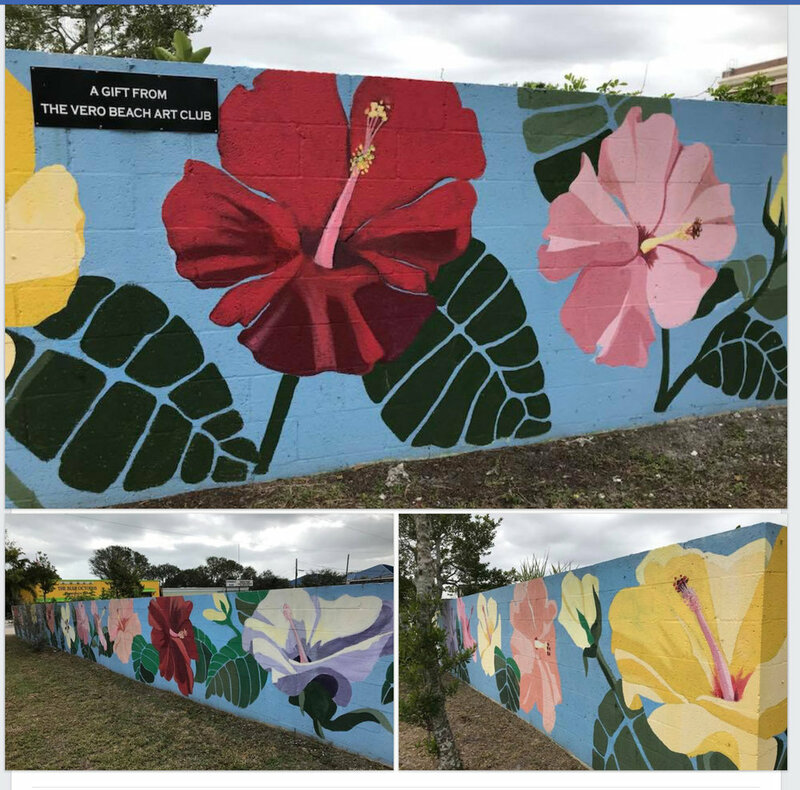 Thanks go out to Art Club member and artist, Carol Makris, who restored the Hibiscus Mural on SR 60 (January 2018) and to Don Smith Paint & Decorating for donating the paint. Wall after restoration by Art Club member and artist Carol Makris. Vero Beach Art Club artist Karen Leffel-Massengill studied Hibiscus flowers in detail before painting the wall by the Old Diesel Plant. It is adorned with large Hibiscus flowers that run all the way around the wall. A dedication ceremony was held at the wall in 2004. Vero Beach Mayor, Pilar Turner gave a proclamation to the Art Club to honor their contribution to beautify Vero Beach. Rita Ziegler and Monte Falls putting the name plaque up on the hibiscus mural for the dedication. Take SR60 eastbound toward downtown. Just past 19th street the old Diesel plant will be on the right. It is being converted into a brewery. After you cross the RR tracks you will see the Hibiscus wall on your right (south side) just before the Blue Octopus Shop. The wall runs along the RR Tracks, across the front side facing SR60 and along Commerce Ave. Click on the map, then go to the street view and scroll and zoom so you can see the wall. It is east of the Diesel plant and the RR Tracks on the south side. Kathy Abrahamson, Joan Marie Barringer, Nick Binghieri, Sue Dinenno, Boyd Fellows, Frank Frazer, Susan Gancher, Jemal Hayes, Lizdiel Ramos-Hering, Steve Hering, Anne Malsbary, Karen Marsh, Bobbie Matus, Tom McCauley, Keith Mills, Patricia Padoll, Phil Reid, Cree Scudder, Lee G. Smith, Rebecca VanCordt, Matthew Ward and John Wartman.